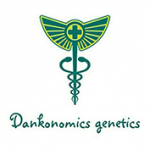 Dankonomics Genetics - Chocolate Stardawg. Free US delivery. An indica dominant strain, Chocolate Stardawg can be grown indoors and outdoors as well as in a greenhouse right up to 50 deg. of latitude. Indoor flowering is 8 - 10 weeks with October harvests outdoors in the northern hemisphere. It's a short to medium-sized, stocky plant with a very good THC level, between 21% and 28%. CBD can edge up to the 3% mark. It provides medical users with strong medicine and is recommended for sleeping problems, pain relief, anxiety, cancer and stress.